Who came out of Bourget? Can you add any names? 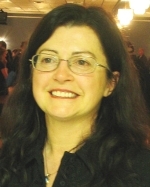 (Bourget, Monday, January 9, 2012) Long-time Bourget resident is being honoured at tonight's Council meeting. After a long and illustrious career as a teacher, Marthe Boileau did not really retire in the 1980s. Turning 95 on December 23, she continues at a pace that would see younger people cringe, volunteering at le magasin communautaire Le Partage de Bourget and the local nursing home . As a recent story in Le Droit says, "Marthe Boileau n'a pas le temps d'arrêter"... she doesn't have time to stop. Thanks to the City and the Bourget Knights of Columbus, Marthe's name was put forward to the Ontario Senior's Secretariat and on December 14, 2011, she was hounoured for her achievements by Ontario's Leutenant Governor, David Onley, in a ceremony at Queen's Park and presented with a 2011 Ontario Senior Achievement Award. The citation in part reads: "Marthe Boileau actively volunteers to assist disadvantaged people in her community of Bourget, whether it’s preparing meals for the Prescott-Russell Association of Community Services or helping organize activities for the residents of Bourget Nursing Home." 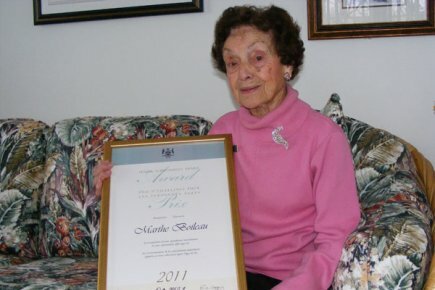 Among her other accomplishments, Marthe has also been a long-time advocat for advancing the French language in Ontario and was also involved in writing the book to celebrate Bourget's Centennial. Bourget is a village in eastern Ontario, Canada, near the Cobbs Lake Creek, in the city of Clarence-Rockland in the United Counties of Prescott and Russell. It was named after Ignace Bourget, who was bishop of Montréal from 1841 to 1876. For a profile you can visit Wikipedia. Following an idea from agrologist Ferdinand Larose in the early years of 1920, the Larose Forest was born, and was named after its instigator. The farmers of the area were then abandoning lands that were too poor and prone to soil erosion. The « Bourget desert » was reforested thanks to a collective effort that is nowadays part of Eastern Ontario’s history. Bourget celebrated its 125th Anniversary in November 2010. There was a lot written up about the celebration. You can read more here. 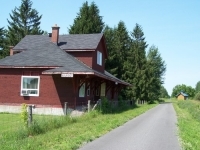 The old M & O Railway was named because it traveled between Montreal and Ottawa. The only remnant of rail on the Ontario right-of-way of the M&O begins near Cyrville Road in Gloucester township and continues to the Ottawa VIA terminal. On a regular basis, VIA Rail continues to use what is known as the M&O wye near Cyrville Road. Can't find what you're looking for? Check our complete site map!